Klein River Farmstead offers an array of exceptional and award-winning South African cheeses. All cheese is made using age-old artisanal methods on Klein River Cheese Farmstead in Stanford. It is the Stanford grass that the cows eat which gives our cheese its delicious taste and sense of place. 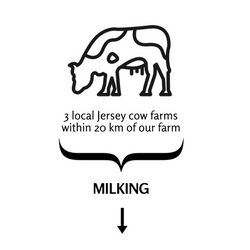 Jersey cows’ milk has a naturally high fat content, and this contributes to the flavour and texture of the cheese. We will only ever use pasture-fed and pasteurised cow’s milk. The milk is sourced from 3 dedicated farmers within 20 km of the Farmstead and is free from hormones and antibiotics. For every 10 litres of milk, 1 kilogram of cheese is produced. At Klein River Cheese, we process about 3 000 litres of milk every day – making only 300 kilograms of handcrafted cheese on a daily basis! 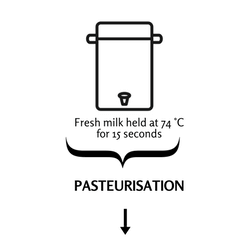 Pasteurisation is a process where we heat the milk to 74 ˚C for 15 seconds to reduce the number of microbes present in the milk, to an acceptable level. There are good microbes and bad microbes, we need to ensure our fermentation is left with all the good guys. We ensure that the good microbes are reinoculated into the milk later on! The magic fermentation process begins by adding starter cultures that change lactose, the sugars naturally found in milk, into lactic acid. This process changes the acidity level of the milk ever so slightly. 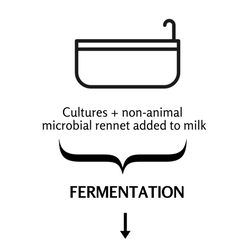 Next, rennet is added to form a coagulum, essentially the milk turns into a jelly like consistency. Once the cheese maker is happy, the coagulum is cut which causes the curds to separate from the whey, the liquid by-product of cheesemaking. Here at Klein River Cheese we only use non-animal microbial rennet and no colourants are added to our cheeses. You may notice differences in colour as the seasons change! Our cheese is therefore 100% happy and vegetarian friendly. After pressing the cheese curds overnight in moulds, the heads of cheese are then placed in a brine bath for up to 48 hours. This helps slow down acid development and encourages a rind to form on the cheese. The brine bath also draws out excess moisture from the cheese. Brining adds a fuller, salty flavour and discourages bad bacterial growth on the surface of the cheese. Affinage, or maturing, is where the cheese really starts to develop its true flavour and is an art in itself. Affinage is a French word that comes from the Latin “ad finis”, meaning “towards the limit”. 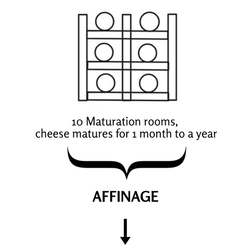 In cheese terms, it describes the science and art of cheese maturation. Once made, the heads of cheese are kept in one of the 10 maturation rooms. The temperature, lighting, humidity and air flow are monitored under very strict conditions while each type has their own very specific needs. Depending on the type, Affinage may vary from one month to one year. 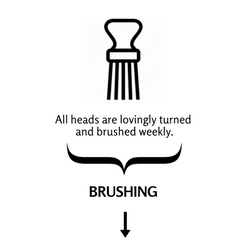 Weekly all our heads of cheese are turned and brushed with love . The cheese is brushed with a brine solution, the salt in the brine encourages yeast and mould growth, while establishing a good rind and enhancing the flavour by breaking down the fats and protein in the cheese. Brushed Rind Cheese rely on cultures on the exterior to galvanize ripening. The magic bacteria used in some of our cheese is B. linens, which is red in colour thus resulting in a red cheese. It also provides the farmyard notes, earthy flavour and nutty notes which are savoured by many! 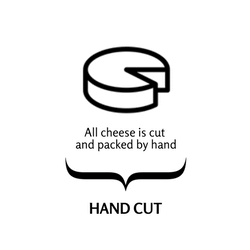 As part of our age-old artisanal methods, each cheese is cut by hand by our dedicated cheese cutter using a sharp 1 meter long cheese knife. Thereafter, it is vacuum-packed to ensure that the cheese stays as fresh as if it has just been plucked from our cheese factory.